Speech, language, and communication are key to young children's well-being and development. 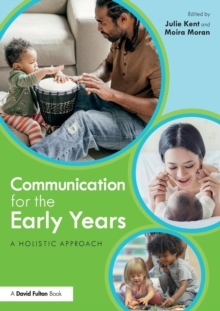 At a time when communication contexts and modalities are becoming increasingly complex and multifaceted, this key text considers how pedagogical approaches, environments, and interactions can be used to develop and harness the voice of the child in the early years. Communication for the Early Years takes a broad, ecological systems approach to communication to present theoretical approaches and principles which map a child's communication experiences in the home, the early years setting, in the local community, through play, and engagement with digital media and the enabling environment, including the outdoor environment. Topics considered include:the role played by pedagogical leadership in the development of an effective communication environmentaspects of the physical environment which encourage or inhibit communicationeffective communication in and between settingsthe importance of toys and resources developments in digital communication and their impact on the childChapters consider perspectives of the child, family, and practitioner to encourage a holistic and collaborative understanding of interaction and the role this plays in a child's development, while case studies, examples from practice and reflective questions inspire discussion, challenge thinking, and encourage the application of research in practice. An in-depth exploration of the factors which impact on the development of a child's communication skills, this will be key reading for students and practitioners in the Early Years, as well as those involved in their training and continued professional development.